Late report from Conflux – Winning! I can’t believe I forgot this in my last Conflux report: I won a prize! Specifically, I took second place in the CSFG/Conflux Short Story Contest, which called for stories up to 4000 words on the theme ‘Red Fire Monkey’. 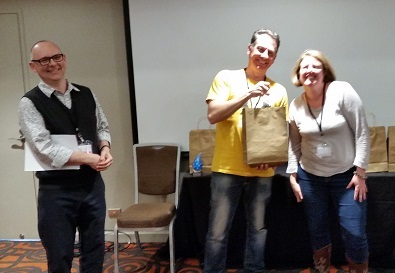 My story ‘The Nature of Monkey’ was chosen by judges Alan Baxter (Convention Guest of Honour and doyen of the Australian dark fantasy fiction scene) and Robert Porteous (three times previous winner of the convention short story contest) as the first runner-up. My hearty congratulations to Pia Van Ravestein for her first place win (‘The Repairer’) and to Pamela Jeffs for her third place (‘Tattoo’). The story is only available to members of the convention, but anyone who would like to read it should sign up to my newsletter in the next week or so. I’ll be including it as my bonus fiction content for this month only. What is the nature of monkey? Australians of a certain age will know the answer. Everyone else will have to read the story. Sign up to my newsletter by filling out the form below. I won’t share your contact details with anyone. This entry was posted in Announcements, Writing news and tagged alan baxter, Conflux, csfg, pamela jeffs, pia van ravestein, rob porteous. Bookmark the permalink. 2 Responses to Late report from Conflux – Winning! Thank you and a huge congratulations to you too David!! Thanks Pamela. I enjoyed your story a lot!